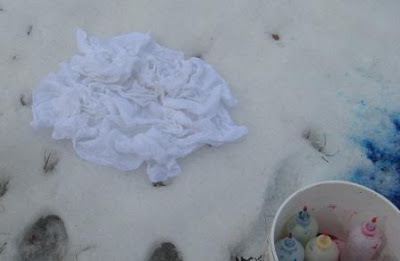 I have spent the last two days dyeing fabric outside in some snow banks. Here I am standing around my field of dyed fabric. Like I am farming. Plant then in the snow with dye (fertilizer) and come back a few hours later to harvest. 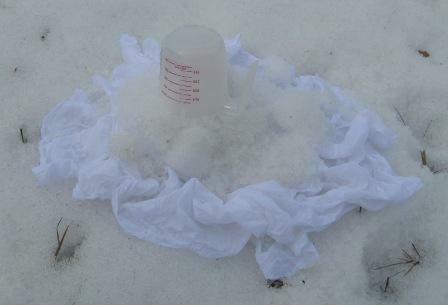 I have been using 1 meter of cotton that has been soaked in soda ash solution. 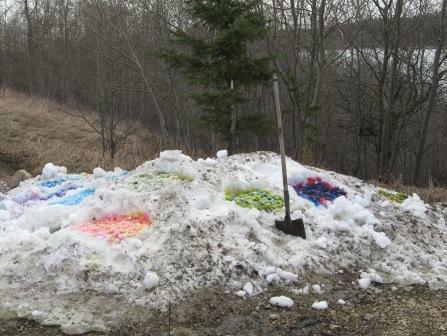 I like this spring snow bank idea, works only when warm spring day. I lay the fabric out on the snow with hills and valleys. I start to cover the fabric with snow. Get all the fabric covered. Taking note were my fabric ends. 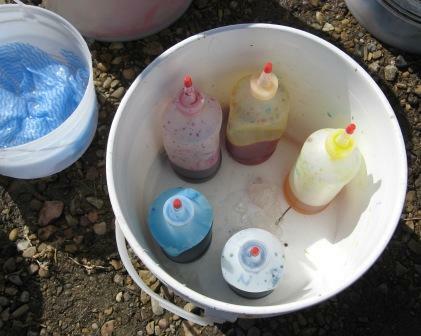 My dyes are mixed and in squeeze jars. I have 1 Tablespoon of dye and about 1 1/2 cups H2O. I have made some mixes and some diluted solutions as well. I do fly by the seat of my pants and just mix at times. A bucket of warm water was very useful to wash cold gloved hands. 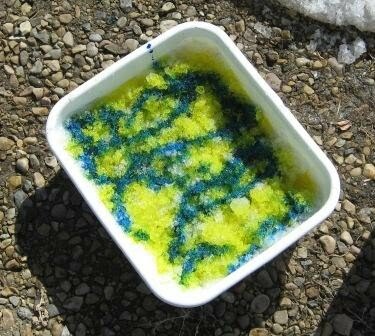 Squeeze bottle dye on to the snow. 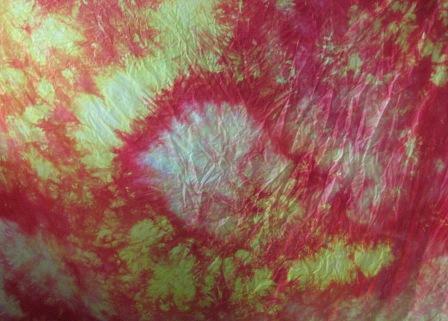 With some time and the warm sun the dye moves down to the fabric. I also did some in trays and some in buckets. 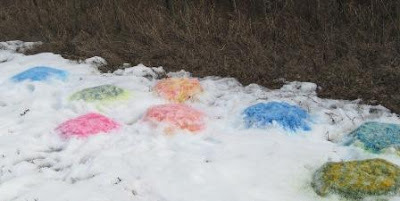 I did not like this as well but if the air temperature was not warm, I could bring these in to warm up and the dye can still get to the fabric. 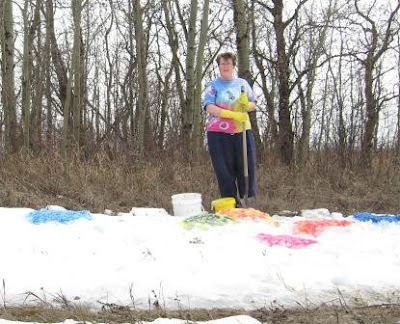 My snow bank fabrics were nicer than the bucket and tray dyeing. I also hate washing out the buckets - we do not have the water hoses hocked up yet (freezing at night still), so I have to hall the bucket inside to washout. Here are 12 fabrics planted for dying. This is the snow bank at the bottom of my parent's driveway. There is a few rocks and grass on the top but not bad snow if a dig down a bit. More planted fabrics in the hay field north of the trees. I am going to Calgary at the end of the month to sell fabric. I have a booth at the Quilt Canada Market mall. I hope to get much more fabric done. I got 10 done yesterday and 24 done today. I have a few that need another layer of dye to be better. 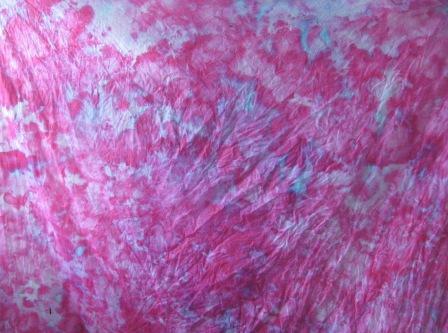 Purple snow dye fabric. These are all for sale. 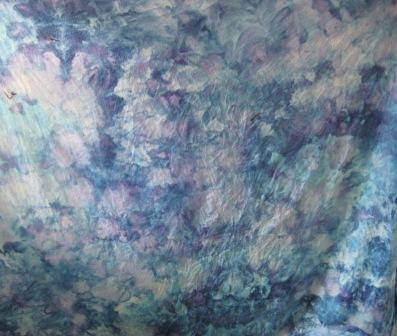 I have many other dyed and painted fabrics that I am working on. And the dyed thread. So keep looking back this month and in May. I will have to post some in May as my life is very busy now. Those look amazing! I better make a beeline for your booth at the end of the month.